It is best for the orthodontist to see children by age 7 to advise if orthodontic treatment is required and when the best time would be for treatment to begin. The first permanent molars and incisors have usually come in by that time and crossbites, crowding, and other problems can be evaluated. When treatment is started early, the orthodontist can guide the growth of the jaw and guide incoming permanent teeth. Early treatment can also regulate the width of the upper and lower dental arches, gain space for permanent teeth, avoid the need for permanent tooth extractions, reduce the likelihood of impacted permanent teeth, correct thumb-sucking, and eliminate abnormal swallowing or speech problems. In other words, early treatment can simplify later treatment. If no early treatment is indicated, we would see your child every six months or yearly to ensure that the jaws continue to grow normally and teeth are developing and erupting as they should. By monitoring jaw growth and tooth eruption, we can determine when you are ready to start with orthodontic treatment. Braces aren't just for kids anymore! A variety of treatment options are available for different age groups, even adults. We have found that adult orthodontic treatment can dramatically improve your self esteem. A bad bite or crooked teeth are factors that can contribute to gum and bone loss, excessive wear on the teeth, headaches, and jaw joint problems. As an adult, it is never too late to improve your smile! The office of Dr. Geldres is always excited to meet new patients. In your initial Orthodontic Evaluation we will discuss the different dental problems present, addressing each of them. Also we encourage you to ask questions that concern you or the main reason why you are seeking help. What are patient payment options and monthly payments? We will discuss different financing options that you have at our office and credit lines offered to you so that you can make an informed decision. What treatment procedures will need to correct your dental problems. We will explain how important your cooperation is in the success of the orthodontic treatment. Is treatment needed soon or should treatment will be delayed till appropriate growth, tooth eruption or other factors that may interfere in the treatment success? At this visit it is imperative patient and patient guardian are present. We also encourage you to bring your dental insurance information to see if your insurance has some type of Orthodontic treatment coverage. Our goal at Dr. Geldres office is to provide you with an affordable, high quality treatment that fits your budget. We will try to be as informative as possible regarding financing options, credit card payments and bank draft. Regarding Insurance Coverage with Orthodontic Treatment, we will find out about your benefits or Insurance policy regarding orthodontic treatment but we can not discounted from our Orthodontic treatment fee given until we had received payments from your Insurance, Because Insurance policies varies from time to time or Insurance benefit might change during course of treatment, These variants are out our hands can control. Once we have these records, we will be able to design your ortho treatment. Patient or patient guardian will sign an Orthodontic contract were states your monthly payments, total cost of treatment, length of treatment, what is included in the orthodontic treatment cost, advantages and disadvantages of Orthodontic treatment. Extractions iIf need them), surgeries for exposing unerupted tooth, gingivoplasty , gum graft, regular dental check ups, cleanings and any other dental treatment linked to the orthodontic treatment success are not included in the orthodontic fee. Also at this appointment we will schedule a future patient appointment for Orthodontic aparatology to be placed Such appointment is 11/2 hour and need to be schedule most of the time during school or work hours due to the length of time need it. We provide school or work excuse letters. If Patient or Patient ‘s guardian still have any questions we encourage to ask us before signing the orthodontic contract because we want our patients to be fully inform. To guide growth to proper parameter to allow proper development of teeth relationship between Upper and Lower jaws. This phase has a big advantage in correcting dental problems, Which one is directing patient growth, Treatment during this phase avoid future extractions, surgeries, correcting habits and training facial and masticatory muscles to created the healthiest environment possible for the eruption of permanent teeth. This first phase of treatment may not prevent the need of Phase II. This phase is an active treatment that begins at the time the last baby teeth are lost or When all permanent dentition is present. Phase II corrects tooth position, space closure, root paralleling , Which ones are important to function and stability. Most of the time Patient that had phase I and later continue with phase II, orthodontic treatment in phase II is reduce as well as less chances of removing teeth. If Phase II is started in an Adult with out having phase I at our office, treatment is directed in correcting dental problems that is particular present in each patient but extractions of teeth are contemplate as well as surgery because we don’t have the advantage of growth that we have in a child and many factor influence influence in tooth transportation in bone like ankylosis of a tooth, root canal teeth , bridge work present , root shortening, medication intake (biophosphonates), among other factors. Underbite: Lower jaw extends out, causing the lower front teeth to sit in front of upper front teeth. Spacing: Caused by missing teeth or having large arches and small teeth. Upper Front Teeth Protrusion: Characterize by the upper teeth extending too far forward or the lower teeth not extending far enough forward. Crowding: Happens when teeth have insufficient room to erupt from the gums. Cross Bite: Upper teeth sit inside the lower teeth which may cause tooth stratification or misaligned jaw growth. Over Bite: The upper front teeth extended out over the lower front teeth covering lower front teeth partially or complete, sometimes causing lower front teeth to bite into the roof of the mouth. Open Bite: Upper and Lower front teeth don’t overlap, most of the time this is cause by habits like thumb sucking, tongue thrusting. Call our office as soon as possible if you break or loosen any appliance, wire or bracket. Please don’t come directly to the office we encourage patient to call us to create a time for you. If the emergency happens at night or over the weekend and we are not able to see you right away, you can use fingernail clippers (previously washed and sterilized in alcohol) to cut wire or cut wire to slide a bracket out wire. 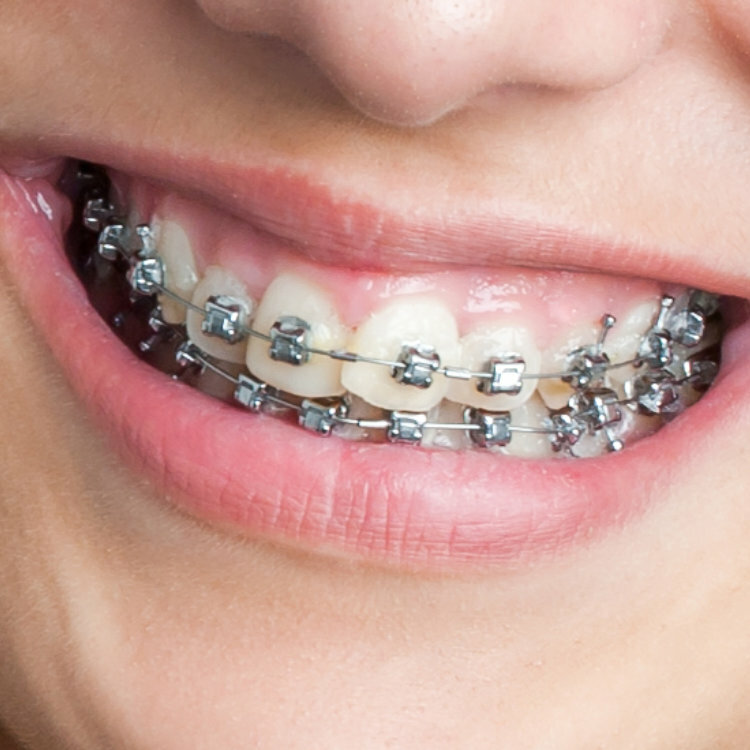 Sometimes small wire can be bent out and produce gum or mucosa irritation, you will resolve the problem moving (bending) out of the irritated area with a cotton swab or eraser if wire bending can not help you try covering wire with sticky wax given to you when your braces were place for first time. During the first week after your braces are in place you will experience some pain ,soreness or discomfort, You may take acetaminophen to help you with the discomfort till you adjust to your new braces. We encourage patients during ORTHO TREATMENT to brush at least 3 times a day or after each food consumption to avoid white spots (decalcification), decay or any type of gum irritation. We have always be monitoring oral hygiene and in contact communication with patient or patient’s guardian. Every time you have your ortho appointment expect mild discomfort in the next days of your appointment. Participating in certain contact sports such as football, soccer, wrestling, karate, basketball, etc, requires a special mouth guard to be worn, provided by our office. If your teeth are loosened or appliances damages due to any accidents, please contact us immediately.